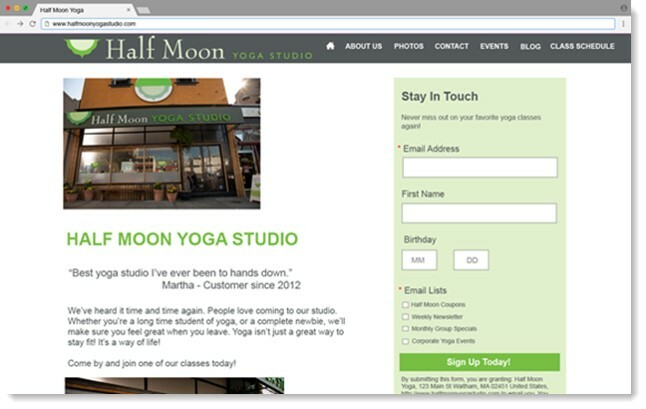 ﻿ 10 Types of Landing Pages to Help You Meet Your Goals » Red Mango Marketing! « What Are Email Marketing Integrations & Why Do You Need Them? Landing pages are a quick, easy, and effective solution to maximize conversions. Today, when everyone is looking for one-click solutions, landing pages provide the answer. Imagine you’re running late for work and have a presentation in an hour. You need to stop at an office supplies store first, but you walk in and see endless aisles with no directions to help you find what you need. The frustration. The agony. The pure wasted time. Your customers may feel the same way when they visit your website for a promotion or sale, and don’t see any call to action. Instead, use a landing page, a specific page dedicated to an event or promotion, as a tool to guide your customer directly to the right place. The best landing page is one that takes you exactly where it promised. When a customer lands on a relevant page, the potential for converting an interested customer into a paying one maximizes. For example, if your email marketing campaign introduces a new line of Fall Fashion and the link takes them directly to a landing page that showcases the clothing line, they’re more likely to make a purchase. What makes a landing page a success? When looking at landing page examples for inspiration, it’s important to first consider the goal of the landing page, the mediums used for promotion, and the tools used to design the landing page. If your goal is more registrations to your event, and you plan to use email marketing as the medium of promotion, then direct subscribers and potential customers should receive an email with a clear call-to-action linking to a landing page dedicated to the event. The landing page design must then give out the necessary information, including reasons why the reader should attend, the event location, and a clear call-to-action to register for the event. If possible, you should also include “social proof” or testimonials and case studies from well-known companies in the space who trust your productor service to achieve some desired outcome. Your email and landing page design should both be clear and concise, making it easy for interested attendees to register. I can’t stress this enough: your landing pages need to be relevant and specific to your goal. You can’t direct people to a page with a promise and then fail to deliver that promise. For example, if you promise a 10% discount, customers should see a 10% discount on your landing page, not a 5% discount, or none at all. Otherwise, your potential customer becomes discouraged and simply closes the tab. In an attempt to be creative and captivating, don’t lose simplicity. Simple landing pages are the most impactful, driving the best results and highest conversion rates. This includes simple and direct landing page copy; a simple design that enhances the information rather than hides it; and a clear call-to-action that tells the potential customer what action you want them to take. You have a whole page’s worth of space, but don’t fill it all with words. Concise landing pages are the best landing pages. Avoid long paragraphs, long explanatory videos, or long sign-up forms. Everyone wants quick results, so that’s what you need to offer in your copy. Here’s an example that shows how to match the expectations of your audience with a dedicated landing page. The first image is the email you send out or the social media post to your followers. Note the “Sign Up” CTA button. The second image is where the call-to-action button leads, to the sign-up landing page. Do you know what they want you to do next? Now that we have discussed what a landing page is and what it takes to meet your goal, let’s talk through examples of different landing page types to help you get started. 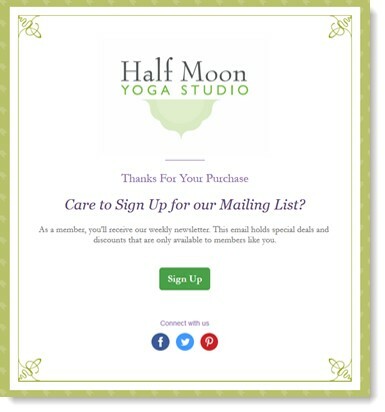 Create a dedicated landing page to boost trials or sign-ups to your email newsletter. Keep the landing page simple, and highlight the key benefits of becoming a member. If you have a trial offer, detail how long the trial period lasts, how it works, and its benefits. A business becomes successful when it can offer a solution to a problem faced by their target audience. These problems or pain points could be the inspiration for creating a landing page, which presents the solution. For example, if you know that your customers find it difficult to organize their desk, and your desk organizer solves that problem, design a landing page that details your solution. Then prompts customers to get organized in a direct call-to-action. Sometimes offering too many products or services can confuse a potential customer. While options are great, people are looking for one specific product or service at a time. Research your most searched-for product, and dedicate a landing page to it to increase sales. If you offer all kinds of hiking gear, and research tells you your Trail Queen hiking boots are the most popular, create a landing page specifically for that product. You can also add a link to related boots at the bottom, to present an alternative. Successful businesses constantly innovate and reinvent their products or services. This means launching new products throughout the year using a landing page for a better chance at conversions. Let’s say you own a bakery and introduce a new category of customized muffins. Create a landing page that allows people to customize and order right there, rather than navigating through your usual delicious offerings and losing them on the way. Holiday sales, clearance sales, special promotions, and VIP deals all achieve bigger results with dedicated landing pages. Everyone loves a good deal, but no one wants to browse through a thousand pages or products to reach that gold mine. Make it easier for your customers to find your sales and promotions with a dedicated landing page. Make sure you use landing page copy that will create a sense of urgency in your landing page visitors. Whether you are a nonprofit organization or a small business, donations and contributions are important if you want to make a difference. Donation buttons on your homepage may get lost in the crowd, so developing landing pages for donation campaigns can help you get more attention. You could also link to a sign-up form for volunteers. Both online and offline events are only as successful as the number of people who attend. To get people to register and RSVP for your next event, create an event landing page with great content. Keep the registration form short and crisp, only asking for the most relevant information. While lead capture forms are usually presented as pop-ups, they can sometimes irritate your customers. To keep customers signing up for your list, create a social and email marketing campaign that directs customers to a landing page with a lead capture form. Have you written a new e-book or created new templates? When it comes to asking people to download a digital product, a landing page is always the best solution. You get space to convince the potential customer why they need it and keep other pages of your website looking crisp and clear. For example, if you’ve curated a guide to holiday gift ideas, send an email with a snippet of the e-book content, and offer customers the complete e-book through a call-to-action button. The landing page could then include a small write-up about the lead magnet, and provide the download link. People are looking for valuable information on a wide range of topics, every day, all around the world. If you created an infographic or a video that could be a great resource for your target audience, it’s time to direct them to a landing page. The focus here is to get people to learn from and engage with your brand. For example, if you have created a “10 Step Guide to Online Marketing” video, create a landing page with a summary, and encourage people to talk about their biggest online marketing mistakes or achievements. 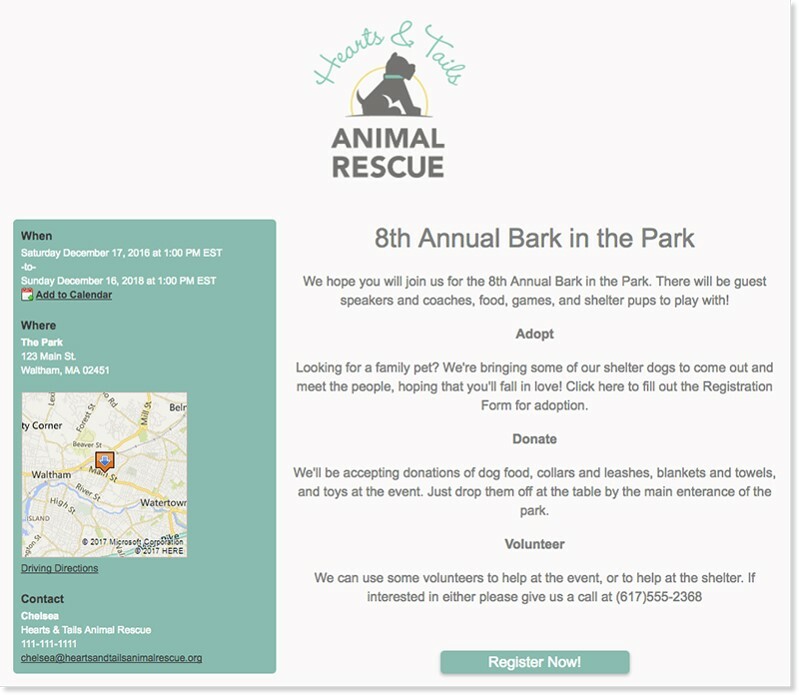 Here’s a great landing page example by an Animal Rescue event. It allows website visitors to register for the event, while also clearly telling them that they can adopt, donate or volunteer at the event. Adding all of this information on your homepage is a mistake, as it cramps your design and causes confusion. It also risks losing impact from the event. The best landing pages are born from attention to detail, a clear goal, a lot of thought, and constant testing. You don’t need to create a landing page for everything your business offers, but when you do design one, make sure it’s impactful and gets people to take the right action and convert. 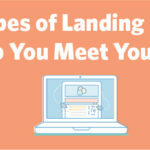 The post 10 Types of Landing Pages to Help You Meet Your Goals appeared first on Constant Contact Blogs. This entry was posted on Monday, December 31st, 2018 at 8:00 am	and is filed under Email Marketing, News & Updates. You can follow any responses to this entry through the RSS 2.0 feed. Both comments and pings are currently closed.